1Department of Horizon Scanning for Innovative Global Health Technology, National Evidence-based Healthcare Collaborating Agency, Namsan Square (Kukdong B/D) 7F, 173 Toegye-ro, Jung-gu, Seoul 04554, Republic of Korea. 2Division for New Health Technology Assessment, National Evidence-based Healthcare Collaborating Agency, Namsan Square (Kukdong B/D) 7F, 173 Toegye-ro, Jung-gu, Seoul 04554, Republic of Korea. 3Department of Public Health, Graduate School of Korea University, 145 Anam-ro,Seongbuk-gu, Seoul 02841, Republic of Korea. ABSTRACT Purpose: To predict the potential impact of selective retina therapy (SRT), as a treatment for diabetic macular edema (DME) and central serous chorioretinopathy (CSC), on the Korean healthcare system. Methods: Using horizon-scanning activities, we identified and filtered promising research-phase health technologies not listed within the domestic insurance system. After a process of prioritization, we selected SRT and evaluated the current clinical evidence concerning this technique. Finally, we analyzed the potential impacts through the peer-review process. Results: A total of 10 studies were included in the review: one randomized controlled trial, two single-arm trials, two cohort studies, and five case series. None of these studies reported severe complications or side effects when SRT was performed on patients with DME and CSC. However, there was a lack of statistically significant evidence regarding the main effectiveness indices (retinal thickness, regeneration of retinal pigment epithelium, and damage to surrounding tissues). Similarly, the outcome of the expert consultation on the potential impact of SRT was that it was a promising and safe treatment for DME and CSC; however, the experts also confirmed that evaluating the effectiveness of SRT is not possible based on existing evidence. Conclusion: SRT is a promising treatment for DME and CSC with great potential for acceptability within the current healthcare market. However, welldesigned clinical trials should be conducted for to confirm its effectiveness. Horizon scanning, Emerging health technology, Potential impact, Selective retina therapy. Horizon-scanning activities were introduced in South Korea in 2014, having been conducted to ensure the efficient allocation of health services and clinical research resources, and to prevent the indiscriminate spread of newly-developed health technologies . The Horizon Scanning Service for Innovative Global Health Technology (H-SIGHT) of the National Evidence-based Healthcare Collaborating Agency (NECA) is the main body responsible for horizon-scanning activities in South Korea. H-SIGHT horizon-scanning activities comprise five stages: identification, filtration, prioritization, assessment, and dissemination;  using this method, H-SIGHT identifies newly-developed health technologies that could be introduced to the South Korean healthcare system within 1 to 5 years [1,2]. In 2015, H-SIGHT selected six emerging health technologies using horizon-scanning activities, and provided timely and useful information to healthcare stakeholders regarding the safety, effectiveness, and potential impact of these technologies on society. One of these technologies was selective retina therapy (SRT). This therapy is used to treat diabetic macular edema (DME) and central serous chorioretinopathy (CSC). The SRT laser technique is consistent with an opt acoustic system and automatic real-time reflectometry. It can automatically detect and control the degree of absorption of the laser treatment beam by the retinal pigment epithelium (RPE) layer through the detection of sound waves and light scattering. The retina is a transparent component of the nervous system that surrounds the inner side of the choroid coat in the posterior two thirds of the eyeball. While photoreceptors and RPE receive nutrients from choroid coat capillaries, the inner sensory layer of the retina receives glucose and oxygen from retinal blood vessels. Normal retina functioning is maintained only when these two structures are fully functioning. Light that enters the eye forms an image on the retina, located on the posterior surface of the eyeball. Two types of photoreceptors in the retina receive light; changes in ion channels in photoreceptors control the activity of neurons, and the activity of neurons transmits the presence of a light signal to the brain. The brain then perceives the sight signal and the object. RPE cells are located between the retina and the choroid coat, and are present in a single layer of hexagonal cells. The cells are tightly bound to each other and act as a blood-retinal barrier preventing infiltration of substances. RPE cells receive nutrients such as glucose and oxygen from choroid coat capillaries and transmit the nutrients to photoreceptors. RPE cells also phagocytize, and degrade aged and shredded photoreceptor particles on outer segment membranes. Deficiency and malfunctioning of RPE cells may result in various diseases [3,4]. Macular degeneration is the most common cause of painless, gradual-onset of bilateral defects in central visual fields, and can occur in non-neovascular or neovascular forms. Neovascular macular degeneration leads to metamorphosis and blurred vision as leaks from newly formed vessels lift the retina and the RPE. Although these symptoms develop gradually, acute vision loss can sometimes occur due to bleeding from sub retinal choroidal neovascular membranes. RPE tears can occur naturally with progression of neovascular age-related macular degeneration, but can also appear during treatment with laser and photodynamic procedures, and antibody injections. The reported incidence of idiopathic RPE tears is 10%; 12–33% of cases occur after photodynamic treatments and 12–15% after antibody injections. However, variable results have been reported, including cases in which vision was maintained after the occurrence of RPE tears as well as cases with poor prognosis. However, no clear cause has been determined for CSC, in which accumulation of sub retinal fluid in the center of the macular leads to deterioration of vision; CSC mostly occurs in middle-aged men [3,4]. According to National Health Insurance Data, the number of patients with retinal disorders in South Korea in 2014 was 714,420 and the estimated cost of care in that year was 134.1 billion KRW. Due to annual increases in the number of patients with severe retinal disorders, the approximate annual treatment costs between 2012 and 2014 have ranged from 101.7– 134.1 billion KRW . The number of retinal photocoagulation implementation cases in South Korea in 2014 was 202,542 (patient number=82,071), and the estimated cost of care in that year was 13.9 billion KRW. The number, patient, and cost of implementation of retinal photocoagulation increased between 2012 and 2014. SRT is a procedure that uses a solid-state laser with neodymium (Nd) that has a longer frequency (1.7 μs) and a shorter wavelength (527 nm) than the previously utilized argon laser. The laser stimulates metabolism in lesions and RPE cell regeneration, and uses real-time feedback. This technique induces the formation of intracellular micro bubbles, while not exceeding the evaporative treatment of RPE cells only. As a new RPE is generated through division and proliferation of cells around the laser treated area, retinal function can normalize, consequently leading to relief of edema and improvement in vision. This technology was developed to maximize the treatment effect within short time periods and to minimize damage to surrounding tissues. In contrast, the existing photocoagulation technique results in permanent retinal damage because it causes thermal burns in surrounding tissues [6–8]. The equipment used in SRT is classified as a miscellaneous ophthalmological laser surgical device (SRT Laser System) that uses the Nd:YLF medium to incise, destroy, and remove ophthalmic tissue, and to treat DME. The device received manufacturing approval from the Ministry of Food and Drug Safety on July 29th 2013 (Approval number 13-1351). On February 25th 2014, the description of the device in manufacturer approval was changed to an ophthalmological laser surgical device that uses the Nd:YLF medium to incise, destroy, and remove ophthalmic tissue, and to treat DME and CSC (Medical Device Policy Division KIFDA-1377) . In Europe, CE marking was obtained in November 2013 and May 2015 for the Smart Laser device for use in DME treatment and the R:GEN machine for CSC treatment, respectively. Photocoagulation with laser beam is widely performed for retinal disorders, and steroid or anti-vascular endothelial growth factor (VEGF) is injected in cases where macular edema is present. Retinal photocoagulation (code: Ja-516) is listed as a similar technology in the current Korean Health Insurance System. In retinal photocoagulation, for treatment of RPE cells, beams are absorbed by tissue pigments, and light energy changes into heat energy thereby coagulating tissue proteins. Retinal photocoagulation directly ablates abnormal leaking vessels, such as capillaries, and increases the internal retinal concentration of oxygen by destroying photoreceptors; this procedure reduces vasoconstriction and vascular leaks. Furthermore, by debriding damaged RPE cells through photocoagulation, the technique improves functioning of the blood-retinal barrier, leading to treatment of macular edema [10–12]. Indications for photocoagulation include CSC, retinal tears, diabetic retinopathy, choroidal neovascularization, occlusion of retinal vessels, retinal periphlebitis (Eales disease), exudative retinitis (Coat’s disease), retinal hemangiomas, retinoblastomas, and choroidal melanoma. In photocoagulation, tissue loss takes place due to high energy, and side effects can occur due to absorption of the beam by the medium. In addition, due to thermal burns to surrounding tissues, visual impairment and other problems can result. Although Lucentis (ranibizumab, Novartis), a monoclonal anti-VEGF antibody, is a relatively safe drug administered to patients with macular edema, RPE rupture after intravitreal injection of anti-VEGF has been recently reported; anti-VEGF is thought to have caused rupture by constricting the choroidal neovascular membrane . Although Eylea (Aflibercept, Bayer Healthcare) has been reimbursable under the Korean Health Insurance System since June 1, 2015, adverse reactions, such as retinal detachment, vitreous hemorrhage, and cataract, have been reported in clinical trials. In terms of pharmaceutical treatment, no drug has been proven to prevent retinopathy or to suppress its progression. Although studies report that photocoagulation can be effective for the treatment of clinically severe macular edema or in cases where edema invades into the center of the macular, the procedure cannot restore lost vision. Furthermore, conclusions are lacking on appropriate timing and therapeutic targets in cases of low-risk proliferative or non-proliferative diabetic retinopathy . H-SIGHT identified 305 newly developed health technologies that was performed based on various scanning sources selected in advance as well as identification of data collected through applications for new health technology assessment and external suggestions. The selection criteria of H-SIGHT comprised innovativeness, appropriateness of introduction to the South Korean healthcare system, and the possibility of introduction in 1 to 5 years [1,2]. Five relevant investigators participated in the filtration process, and they filtered eight health technologies through agreement. At the prioritization process, H-SIGHT invited 8 medical experts from various fields chosen at random from a pool of approximately 800 NECA health technology assessment specialists. At a head-to-head interview, the experts were asked to prioritize the nine technologies based on the following prioritization criteria: disease burden, clinical impact, innovativeness, economic impact, acceptability in the clinical field, social impact, and current clinical evidence. 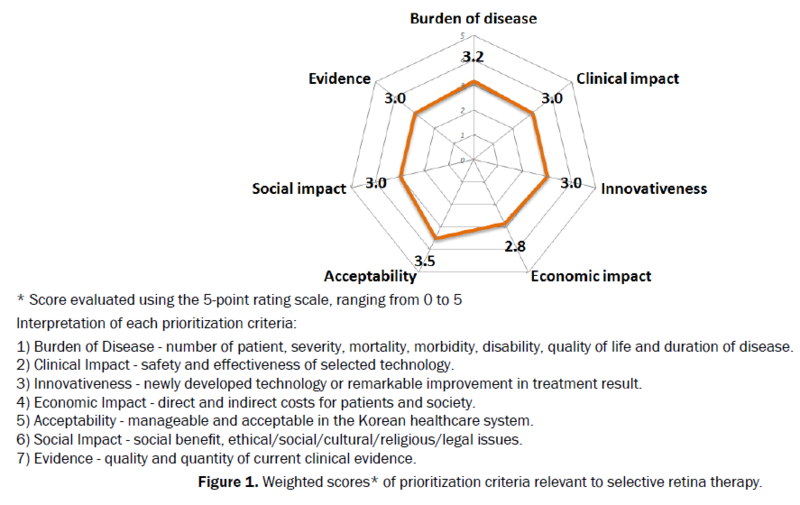 Priority was determined using a total weighted score, in which the significance of each prioritization criterion had been determined in a survey of 54 Korean healthcare professionals. Specifically, each criterion had been weighted using a 5-point scale, by which the nine selected technologies were later ranked [1,2]. SRT was among the highest-ranked of the four technologies. Figure 1 shows the weight of each prioritization criteria in the case of SRT. 1) Burden of Disease - number of patient, severity, mortality, morbidity, disability, quality of life and duration of disease. 2) Clinical Impact - safety and effectiveness of selected technology. 3) Innovativeness - newly developed technology or remarkable improvement in treatment result. 4) Economic Impact - direct and indirect costs for patients and society. 5) Acceptability - manageable and acceptable in the Korean healthcare system. 6) Social Impact - social benefit, ethical/social/cultural/religious/legal issues. 7) Evidence - quality and quantity of current clinical evidence. Figure 1: Weighted scores* of prioritization criteria relevant to selective retina therapy. In the horizon-scanning assessment stage, we consulted four ophthalmologists, randomly selected from a pool of approximately 800NECA health technology assessment specialists, regarding the potential impact of SRT. The ophthalmologist rated the potential impact of SRT based on the following parameters: fulfillment of unmet needs; improvement in patient health; influence on health disparities; influence on the healthcare delivery system; patient and clinician acceptance; impact on healthcare costs; and impact on social, ethical, legal, political, and cultural aspects. They graded each of these criteria on a 5-point scale. In addition, they provided their subjective opinions on the technology [1,2]. In order to examine the evidence related to the purpose of the study, a literature review was performed in Ovid-MEDLINE (1946 to March 29, 2016), Ovid-Embase (1974 to March 29, 2016), Cochrane Library (to March 30, 2016), PubMed (to March 30, 2016), Google Scholar, and Korean databases, including Korea Med, KISS and Kmbase, without any time limitation, between March 28–30, 2016. The terms ‘selective retina therapy’ (or SRT), ‘retinal pigment epithelium’ (or RPE), and combinations of these terms were used to identify relevant studies. Inclusion criteria were all human studies with English and Korean languages; furthermore, studies that reported patient outcomes, including randomized controlled trials, case reports, case-series, or observational studies were selected. Reviews, letters, and comments were excluded. Titles and abstracts of retrieved articles were screened to examine fulfillment of the inclusion criteria [15-18]. Following this, the full texts of eligible studies were reviewed. In order to be considered for inclusion, studies had to involve human subjects, be published in either English or Korean, and report patient outcomes. The titles and abstracts of retrieved articles were screened to determine whether they fulfilled the inclusion criteria. The full texts of eligible studies were then reviewed. In addition, we searched HTA reports on HTA-related websites, horizon-scanning technology reports (http://euroscan.org.uk), and ongoing studies (http://www.clinicaltrials.gov) using the search terms mentioned above. Overall, 664 studies on SRT were identified (after duplicate files were removed), of which 654 were excluded because they did not meet the criteria. A total of 10 studies (one randomized controlled trial [RCT], two single-arm trials, two cohort studies, and five case series) were included. Table 1 shows the details of the 10 studies obtained. In order to confirm the safety of SRT, we reviewed the side effects of treatment including; changes in retinal thickness, reduction in vascular leaks, changes in vision, and changes in RPE cells. Regarding effectiveness outcomes, rate of reoperation, complete recovery rate, and the change of retinal thickness and vascular leak were included. The level of statistical significance was set at 5%. Table 1: Summary of preceding studies for selective retina therapy. Five studies (two single arm trial, one cohort study, and two case studies) investigated the safety of SRT. Roider et al. and Park et al. performed SRT in DME patients and no side effects were observed. Furthermore, no postoperative side effects were observed in studies on CSC patients by Elsner et al. , Framme et al. and Kang et al. .
Studies that investigated retinal thickness, a main effectiveness variable of SRT, were conducted only on DME patients; in two studies, changes were observed during 6-month follow-up periods. In the study by Roider et al. , retinal thickness decreased from 383 ± 80 μm before the operation to 370 ± 82 μm after the operation, although the difference was not statistically significant (p=0.07); in the study by Elsner et al. , the thickness decreased from 232 ± 120 μm before the operation to 210 ± 132 μm after the operation. When fully recovered patients were compared in terms of postoperative reductions in vascular leaks, no statistically significant difference was observed in a RCT conducted on 14 CSC patients (p=0.081) . Furthermore, in four DME case studies, there was no significant change in the reduction of vascular leaks (p=.88) . Complete recovery rates of 35.8–85.2% were reported in three other case series [20,22,24]. Changes in vision were reported in four studies conducted on DME patients [17,20,23,25]; although vision was significantly improved in three case series, no significant difference was recorded in one case series. Five studies conducted on CSC patients [18,19,22,24,26] reported changes in vision; although a significant difference was observed in three studies, no significant change was recorded before and after intervention in two case series (total of 32 patients). Six studies reported changes in RPE cells. Changes caused by the existing laser operation and SRT were all within the normal range; furthermore, in groups that received interventions, no cellular changes were observed after the procedure [17-19,21,25,26]. The reoperation rate was reported at 17.9–37.5% in four studies, and all symptoms improved after reoperation [19,22,25,26]. On the basis of expert opinion, we analyzed the potential impact of SRT, considering a variety of factors such as disease burden, innovation, economic impacts, acceptability, evidence, and social ripple effects. All experts agreed that SRT selectively treats damaged RPE in DME and CSC patients, it is superior to existing laser treatments, and is expected to be an additional treatment option. Furthermore, it can replace retinal injection treatments, such as Lucentis injection, that present a considerable cost burden for patients. Although the existing treatment of CSC, that has long disease duration, mainly involves observation of progression, SRT is expected to treat CSC within a short time period. Furthermore, in comparison with current technologies using intravitreal injection of steroid or anti-VEGF antibodies, the SRT technique is less invasive. In addition, since no side effects or tissue damage has been reported; SRT appears to be free from safety concerns (Figure 2 and Table 2). Figure 2: Scoring of the potential impacts of selective retina therapy on the South Korean healthcare system. - SRT has a positive point in that it could be an alternative therapy for intractable diabetic macular edema and does not damage the surrounding tissue. - Regarding the dramatic increase of effect, current evidence leaves room for doubt. - For the verification of side effects for SRT, long-term evaluation is needed. - SRT can be the alternative treatment for intractable diabetic macular edema and central serous chorioretinopathy. - For the exact verification of effectiveness for SRT, opto-acoustic system included clinical trials are needed. - A learning curve could be needed when SRT is introduced in Korean healthcare field. - SRT has a positive point in that it can replace expensive injectable medicines as lucentis (ranibizumab). In addition, it may be a promising therapy to the central serous chorioretinopathy (CSC) that does not have alternative therapy. - Although, SRT was developed many years ago, there is not enough basic research. All aspects considered, post market evaluation is required. - It is reported that SRT is superior to existing technologies; however, there is not concord credibility with regards to its safety. - SRT is a superior therapy to the existing laser therapy in that it could treat damaged retinal pigment epithelium selectively. - SRT is a less invasive therapy than existing intravitreal injection of anti-VEGF or steroids. - Clinical validity is unverified and there are some concerns for indiscriminate dissemination without marked effectiveness. Table 2: Expert opinion on the potential impact of selective retina therapy. However, whether this technique will provide many benefits remains controversial. Furthermore, although the technique was developed a while ago, adequate basic studies have not yet been conducted, and evidence is lacking to evaluate its clinical effectiveness. In clinical settings, the technique might also be used inappropriately, despite the fact that its clinical effectiveness has not yet been confirmed. The experts also suggested that clinical trials considering the optoacoustic system should be conducted to accurately confirm the effectiveness of the technology, and that long-term evaluation of side effects should be performed. Furthermore, they suggested that learning curves may be required for operators when the technique is initially introduced into the Korean medical market. Therefore, adequate clinical trials should be conducted to evaluate factors such as changes in retinal thickness, regeneration of RPE, and damage to surrounding tissues, and evidence should be accumulated in order to determine the clinical effects of the technique. Framme et al. confirmed RPE cell damage after performing SRT on nine cases of maculopathy (diabetic maculopathy, geographic atrophy, macular degeneration, and CSC). In this study, the procedure was safely and selectively performed on the lesions to be treated, and no side effects, including neurological damage or rupture, were observed. According to a study by Koinzer et al. , sub macular fluid was completely decomposed within 1 to 5 months following SRT in three patients who previously had chronic accumulation of fluid, and all patients experienced improvements in vision in follow-up treatments that lasted for more than 16 months. In the Lutronic Corporation’s clinical trial of R: GEN involving 30 patients (14 eyes in the treated group and 16 eyes in the control group), the procedure was conducted on the fovea (the center of the macular) in the treated group; after 3 months, vision improved by 30% in the treated group. Furthermore, sub retinal fluid reduced by 20%. The aim of this study was to use horizon-scanning activities to predict the impact of SRT. SRT has recently been CE marked in European countries. In Korea, a New Health Technology Assessment was conducted on SRT in 2014 with the committee determining SRT to be free of safety concerns, since no side effect had been reported in DME and CSC patients. However, studies reporting on the main effectiveness indices of SRT (retinal thickness, regeneration of RPE, and damage to surrounding tissues) are lacking. Therefore, SRT was designated as an investigational phase technology that required more evidence of clinical effectiveness. As a result, due to the lack of evidence for its effectiveness, SRT could not enter the Korean healthcare system. In addition, there is currently no set price for SRT in other countries. Photocoagulation with laser is widely performed for retinal disorders, and steroid or anti-VEGF is injected in cases where macular edema is also present. Retinal photocoagulation (code: Ja-516) is listed as a similar technology in the current Korean Health Insurance System. In retinal photocoagulation, used for treatment of RPE cells, beams are absorbed by tissue pigments, and light energy changes into heat energy, thereby coagulating tissue proteins. Retinal photocoagulation directly ablates abnormal leaking vessels, such as capillaries, and increases the internal retinal concentration of oxygen by destroying photoreceptors; the procedure reduces vasoconstriction and vascular leaks. Furthermore, by debriding damaged RPE cells through photocoagulation, this technique improves the functioning of the blood-retinal barrier, leading to treatment of macular edema [10–12]. Indication for photocoagulation include CSC, retinal tears, diabetic retinopathy, choroidal neovascularization, occlusion of retinal vessels, retinal periphlebitis (Eales disease), exudative retinitis (Coat’s disease), retinal hemangiomas, retinoblastoma, and choroidal melanoma. In photocoagulation, tissue loss occurs due to high energy, and side effects can occur due to absorption of the beam by the medium leading to thermal burns of surrounding tissues, visual impairment and other problems. Although Lucentis (ranibizumab, Norvatis), a monoclonal anti-VEGF antibody, is a relatively safe drug administered in patients with macular edema, RPE rupture after intravitreal injection of anti-VEGF has been recently reported; anti-VEGF is thought to have cause rupture by constricting choroidal neovascular membranes . Although Eylea (aflibercept, Bayer Healthcare) has been reimbursable under the Korean health insurance system since June 1, 2015, adverse reactions, such as retinal detachment, vitreous hemorrhage, and cataract have been reported in clinical trials. In terms of pharmaceutical treatment, no drug has been proven to prevent retinopathy or to suppress its progression. Although some studies report that photocoagulation can be effective in patients clinically severe macular edema or in cases where edema invades into the center of the macula, the procedure cannot restore lost vision. Furthermore, conclusions are lacking on appropriate timing and therapeutic targets in cases of low-risk proliferative or non-proliferative diabetic retinopathy . Health technology assessments for SRT have not yet been conducted in other countries. With regards to ongoing clinical trials, we searched for SRT-related information on the clinical trial registry website (http://www.clinicaltrials.gov), and identified a total of eight ongoing or planned clinical trials on DME and CSC patients. However, only two trials were completed and the others were in the recruitment process. In March 2015, Lutronic Corporation (Korea) announced that it would conduct a global (in Korea, Italy, Germany, etc.) marketing clinical trial of R: GEN, its main product, on CSC patients; the trial is scheduled for early 2016. This study is limited by the number of articles included in the literature review. Although we searched and reviewed all the articles related to the selected health technology, due to the characteristics of newly developed health technologies that do not have adequate clinical evidence, only a few articles were available. Moreover, most of the selected articles regarding selective retina therapy did not report the conflicts of interest; only three articles declared that the authors had conflicts of interest with the manufacturers of the devices used. Although the selected articles tried to show the results objectively, manufacturers have a tendency to shield negative information from other parties. Therefore, there exists some possibility of unreported results or unknown information for this technology. In the future, it is necessary to examine in detail the conflicts of interest of the quoted articles to specific health technologies, with continuous consultation from objective experts who are well versed in the selected health technology throughout the horizon scanning process. To our knowledge, this is the first study in which horizon-scanning activities were used to assess the current clinical evidence and evaluate the potential social impact of SRT on the South Korean healthcare system. We found that SRT could be used to treat DME and CSC, and that the technology is expected to be introduced into the domestic market within 1–3 years. However, it will be necessary to continue accumulating evidence in order to precisely characterize the adverse reactions caused by this technology within the context of patients with DME and CSC, and to accurately determine its effectiveness for retinal thickness, regeneration of RPE, and damage to surrounding tissues. Our study could be used as a reference point for developing further clinical studies or systematic reviews, and for the adoption of SRT in the South Korean healthcare system. The study was undertaken as part of the research project of the Horizon Scanning Service for Innovative Global Health Technology at the National Evidence-based Healthcare Collaborating Agency in South Korea (Report No. NECA-H-15-006). The NECA is funded by the Ministry of Health and Welfare. Sungkyu l, et al. National evidence based healthcare collaborating agency, editors. Study of horizon scanning and potential health impact assessment of emerging health technology and development of operation system of h-sight. 2014. JooyeonP, et al. Establishment of horizon scanning system for new and emerging health technology. Evidence and value. 2014;6:12–23. Lee JH, et al. Ophthalmology, 9th edition. 2012. The Korean association of internal medicine. Harrison’s principles of internal medicine. MIP publishing. 2010. Health insurance review & assessment service (HIRA). Disease and medical practice statistics. 2014. Neumann J and Brinkmann R. Cell disintegration by laser-induced transient microbubbles and its simultaneous monitoring by interferometry. Journal of Biomedical Optics. 2006b;11:1–111. Neumann J and BrinkmannR. Nucleation dynamics around single micro absorbers in water heated by nanosecond laser irradiation. Journal of Applied Physics.2007;101:114701–114709. FrammeC, et al. Selective targeting of the retinal pigment epithelium in rabbit eyes with a scanning laser beam. Investigative Ophthalmology &Visual Science. 2007;48:1782–1792. Ministry of food and drug safety. Information on item classification. Del Priore LV, et al. Response of pig retinal pigment epithelium to laser photocoagulation in organ culture. Archives of Ophthalmology. 1989;107:119–122. Wallow IH. Repair of the pigment epithelial barrier following photocoagulation. Archives of Ophthalmology. 1984;102:126–135. Hg Yoo. Ophthalmological laser treatment. NaewaeHaksoolpublishing.2010. Jo YJ, et al. Macular hole following intravitrealranibizumab injections for choroidal neovascularization. Korean Journal of Ophthalmology 2010;51:774–778. DRS (Diabetic Retinopathy Study). 2003. FrammeC, et al. Comparison of threshold irradiances and online dosimetry for selective retina treatment (srt) in patients treated with 200 ns and 1.7 ms laser pulses. Lasers in Surgery &Medicine. 2008;40:616–624. KoinzerS, et al. Selective retina therapy (SRT) of chronic subfoveal fluid after surgery of rhegmatogenous retinal detachment: three case reports. GraefesArchive for Clinical &Experimental Ophthalmology. 2008;246:1373–1378. Park YG, et al. Safety and efficacy of selective retina therapy (SRT) for the treatment of diabetic macular edema in Korean patients. GraefesArchive for Clinical &Experimental Ophthalmology. 2016:1–11. Kang S, et al. Selective retina therapy in patients with chronic central serous chorioretinopathy. Medicine. 2016;95:e2524. RoiderJ, et al. Selective retina therapy (SRT) for clinically significant diabetic macular edema. GraefesArchive for Clinical &Experimental Ophthalmology. 2010;248:1263–1272. ElsnerHP. Selective retina therapy in patients with central serous chorioretinopathy. Graefe'sArchive for Clinical and Experimental Ophthalmology. 2006a;244:1638–1645. FrammeCW. Structural changes of the retina after conventional laser photocoagulation and selective retina treatment (SRT) in spectral domain Oct. Current Eye Research. 2009;34:568–579. ElsnerH, et al. Selective retina therapy in patients with diabetic maculopathy. [German]. Der ophthalmologe: Zeitschriftder deutschenophthalmologischengesellschaft. 2006b;103:856–860. KlattC, et al. Selective retinal therapy for acute central serous chorioretinopathy. The British Journal of Ophthalmology. 2011;95:83–88. RoiderJ, et al. Sub threshold (retinal pigment epithelium) photocoagulation in macular diseases: a pilot study. The British Journal of Ophthalmology. 2000;84:40–47. KlattCE. Selective retina therapy in central serous chorioretinopathy with detachment of the pigmentary epithelium. Ophthalmologica. 2006;103:850–855. FrammeC, et al. Selective retina therapy in acute and chronic-recurrent central serous chorioretinopathy. Ophthalmologica. 2015;234:177–88.